Dred held his wife’s hand as they looked into each other’s eyes. They had been fighting this battle for eleven years. They held out hope for a victory, but realized the odds were against them. Five of the nine judges were from the South. Another, from Pennsylvania, was pro-slavery. They were not the first to sue for their freedom, but they prayed their outcome would be a victory for all. 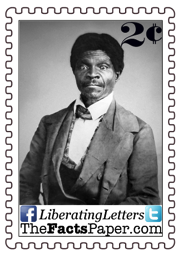 Dred Scott was born in Southampton County, Virginia, shortly before 1800. His owner, Peter Blow, eventually took the Scott family with him to St. Louis, Missouri. After Blow died sometime in the early 1830’s, U.S. Army surgeon, John Emerson, purchased him. Beginning in 1834, Scott accompanied the Emerson family during several transfers that took them from the slave state of Missouri to Illinois, a free state, and Wisconsin Territory, which was also free. In 1838, the roughly 40-year-old Scott married 21-year-old Harriet Robinson. The slave of another army doctor, her ownership was transferred to Emerson. They all returned to Missouri in the early 1840’s, where Emerson died in 1843. With the doctor gone, Scott and his family wanted their freedom. Since they had lived several years in free areas, they believed they had earned their release. Scott tried to purchase their freedom from his widow, Irene, in 1846, but she refused. Scott had no choice but to sue. Scott was victorious with his first lawsuit. However, Emerson appealed to the Missouri Supreme Court, which ruled in her favor. During this time, she moved to Massachusetts and transferred ownership to her brother, John Sanford of New York. This allowed Scott to take his appeal to Federal Court, which he again lost. His next step: the Supreme Court. While all these lawsuits were transpiring, Congress administered changes on a national level. As I explained in The Birth Of A Movement, the Kansas-Nebraska Act of 1854 forced abolitionists to form the Republican Party. The fight between slave states and free states already began drawing blood. Democrat President-elect James Buchanan prepared to enter the White House as the Supreme Court heard the Dred Scott vs. Sanford case. In what seemed equivalent to the president invoking his opinion onto the court, Buchanan contacted several justices asking for a vote for slavery. He wanted to try to secure several favorable outcomes. First, Buchanan wanted the winning decision to have votes from both the North and the South. As five justices were Southern and former slave owners, it seemed likely Scott would loose. Buchanan concluded a vote from a Northern justice would prevent push back from abolitionist. He did achieve some Northern votes. The Democrat ones. The only two dissenters were also the only two Republicans. Second, Buchanan sought a ruling that would end the slavery battle for good. Chief Justice Roger B. Taney obliged, using the court to push the Democrat agenda even further. Taney swore-in his fellow Andrew Jackson Administration colleague two days before the court released their verdict. (see The Forgotten Date). Having already been tipped off to the result, Buchanan proclaimed the slavery issue would be “speedily and finally settled.” He continued, “To their decision, in common with all good citizens, I shall cheerfully submit, whatever this may be.” Not a bold statement considering he already knew the decision. On March 6, 1857, the Supreme Court ruled that Scott was not a citizen and therefore not legally able to sue. Yet Taney’s written decision proceeds way beyond the scope of the case. It attempted to cement slavery in the United States forever. The majority ruling decided that Scott, as a slave, had no right to sue as he was not a citizen. This could have been enough to satisfy the case. However, Taney did not stop there in his written opinion. He rendered a citizenship verdict on all Africans, past, present and future. Taney laid out a case claiming the Founders never meant for Africans to be citizens, ever. Except, in Justice Benjamin R. Curtis’ dissent, he clearly refutes this claim as several states recognized Africans as citizens with voting rights at the time of the Articles of Confederation. But Taney was only just getting started. He cited the 5th Amendment, which prohibits denying a person’s property rights without due process. Therefore, even in a state where slavery was illegal, Taney argued slaves could not be taken from their owner nor considered free. To go even further, he inserted that Congress had no authority to prohibit territories from allowing slaves, rendering the Missouri Compromise unconstitutional. Taney believed his opinion put to rest the issues of slavery forever. In reality, it opened Pandora’s Box. Abolitionists, Republicans, and Northern states revolted. They immediately saw the ripple effects of Taney’s declarations. For people fighting to give blacks equal rights, Taney not only denied that goal forever, he took away the citizenship of blacks who already enjoyed it. Taney apologists argue he was trying to take the slavery issue out of Congress’ hands and giving it back to the states when he limited their authority. However, by also involving the 5th Amendment, it was taking it out the states’ hands as well. Those states that already voted against slavery were now forced to allow slaveholders to enter with their slaves. Before long, Southerners would be settling in all states, regardless of the state’s slavery stance. With a stroke of a pen, Taney ensured slavery would infest the entire country with no hope for its abolishment. For the next three years, Republicans gained traction with Northerners, running on a platform to end slavery. Abraham Lincoln’s election meant a declaration of war for the South. Even though Lincoln said he would not abolish slavery, they seceded. (see How The South Was Won) Buchanan thought he won the battle. All he did was ensure a war. The overreach of Democrats to make slavery permanent forced the Civil War, which abolished slavery permanently. Immediately following the Supreme Court’s Dred Scott Decision, the Blow family bought Dred and Harriet and filed to release them. The Scott’s received their freedom on May 26, 1857. Dred died 18 months later from tuberculosis, but it was as a free man. Harriet survived through the Civil War, and lived long enough to see all slaves freed with the 13th Amendment (1865), receive citizenship with the 14th Amendment (1868) and witness black men receive voting rights with the 15th Amendment (1870). (see America’s Voting Record) Harriet died in June of 1876 knowing their fight was a victory for all.